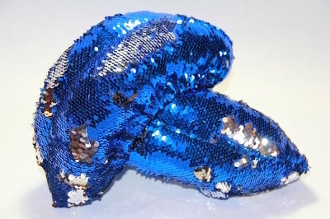 This pair of Fuzzy Soakers® is made of the hot new Mermaid Flip Sequin. It is all the rage! Rub your hand across the soakers to flip from iridescent royal blue to silver. One size fits up to 12 1/2" blade (blade measurement toe pick to tail).